Many the good man has been led astray, and so it was with the handsome warrior, Diarmaid O Duibhne. Enticed into elopement by that trollop Gráinne, they went on the run from hoary old Fionn. So he fled back to the land of his tribe, the Corca Dhuibhne of the great peninsulas of West Munster, or the people of the goddess Dovinias as it has been written in Ogham. There he sought sanctuary for a while on this wild spur high above the crashing waves, which thereafter took his name. So much for our shared heritage, but one of the local landowners usen't to be of the sharing disposition; skull and cross-bone bedecked signs warning 'No Hillwalking' (dis)graced the bothairín that accesses this wonderful pinnacle until a number of years ago. No such problems were apparent in late August 2015 as we parked our car considerately just beyond the end of the tarmaced road at Q34868 07629 A and walked along the unsurfaced track until one reaches open ground. A sharp but short ascent brings you to the exposed spike. 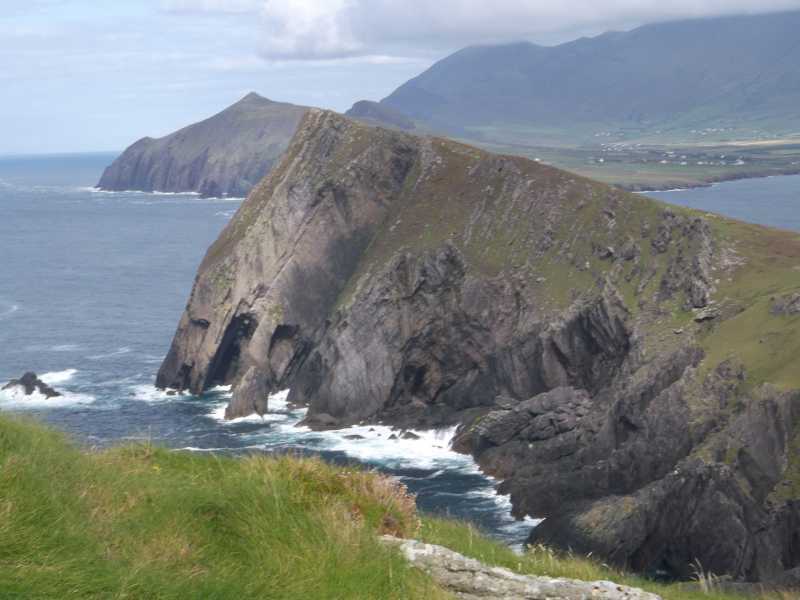 We tracked westward along An Triúr Deirféar, the Three Sisters, taking in Ceann Sibéal and descending towards the Dun an Oir hotel as better described in the entries under same.